The careers of scholars usually last longer than those of stock car racers. Two 90-year-old Jesuits living halfway around the world from each other demonstrated this last year by publishing new books. To be exact, the books were copyrighted in 2006 but actually appeared some months later. Since America is sponsored by Jesuits, it may be allowed to call attention to two items not likely to be displayed on the book racks in airports. The publishers in these cases do not have household names. One is the Jesuit Communications Foundation in Quezon City, the Philippines, which has brought out Unusual and Ordinary: Biographical Sketches of Some Philippine Jesuits(249p) by Miguel A. Bernad, S.J. ; and Orlando Truth Inc. of Tangerine, Fla., has published The Miraculous Parallelisms of John (168p), a close and sophisticated analysis by John J. Gerhard, S.J., of underlying literary patterns in the Fourth Gospel. Father Bernad has drawn profiles of 20 deceased Jesuits who worked in the Philippines at one time or another between 1866 and 2006. Their number includes Spaniards, Americans and Filipinos. When this period began, jurisdiction over the Philippine Mission of the Society of Jesus was exercised by the Jesuit Province of Aragon, Spain. In 1927 that care was transferred to what was then known as the Maryland-New York Province. The Philippine Province was established in 1958; today it has some 330 members, of whom 29 are Americans who entered the Society of Jesus in the United States. Father Bernad himself joined the Society in the Philippines in 1932, when he was 15 years old. He was ordained in 1946 at Woodstock College, the former Jesuit house of studies in Maryland, and in 1951 he received a Ph.D. in education from Yale University. For more than a half-century since then, he taught language and literature in three Jesuit Philippine universities and has been an editor of scholarly journals. The essays collected here are arranged in chronological order beginning with an account of a Spaniard, Federico Faura (1840-97), a largely self-taught scientist who developed a small meteorological station in Manila into a versatile observatory that pioneered in the study of typhoons. Miguel Bernad knew personally most of those about whom he writes; and, as he says, there are many others whose stories he might have included. Among those remembered is an American, Carl W. J. Hausmann (1898-1945), who died in January 1945 of starvation on a Japanese prison ship, where he had heroically ministered to his fellow prisoners. The last and next to youngest of those memorialized is Teodoro Arvisu (1920-57), who served in the Philippine Army after Pearl Harbor and died far too young, humanly speaking, of a brain tumor five years after his ordination. Father Bernad’s book nourishes optimism about the human condition, because it evokes the images of good men who got things done. Father Gerhard’s book is also encouraging, because the word for him is steady. Except for a period from 1953 to 1957 when he was a U.S. Air Force chaplain, he has been a teacher most of the time since his ordination in 1949. For some 30 of those years, he was a professor of theology at St. John’s University in New York City, with furloughs for sabbaticals in biblical studies. Some exegetes have said that first-century editors of the Fourth Gospel dislocated its original order. Father Gerhard argues, on the contrary, that a careful study of this Gospel reveals literary patterns—concepts and passages that are matched and harmonized with one another—that were imposed upon the text by an inspired writer who was its principal author. At Father Gerhard’s request, a firm of actuaries calculated the mathematical probability of these parallelisms having occurred by chance and concluded that the odds against this are 9,999 to 1. Of course, Father Gerhard’s book is not for people who want something to coast through while watching television. It is a technical work aimed at biblical scholars, some of whom are skeptical of the study’s methodology. John Gerhard is serenely collecting these disagreements. Not long ago, he remarked that he will consider those objections in a revision of his book—a project he is working on right now. I was very delighted, as I am sure will be Fr. Bernad, who lives in the same comunity with me at Xavier University, to read the commentary on two remarkable Jesuit nonagenarians. I would like to add one more amazing note about Fr. Bernad. On December 18th an honorary doctorate in the humanitiies was conferred upon Fr. Bernad by Ateneo de Davao University, in consortium with Ateneo de Zamboanga University and Xavier University-Ateneo de Cagayan, in a Joint Convocation. Fr. Bernad's response was a magnificent one hour and fifteeen minute lecture on the history of the Jesuits in Mindanao, presented standing, without notes, and flawlessly reflecting the written text which someone was following. His accomplishments stand as a seemingly unattainable challenge and an inspiring example to the six younger octogenarians and six septuagenarians who make up our twenty two member Jesuit community at Xavier University in Cagayan de Oro. Unlikely though it may seem, may his tribe increase. I enjoyed reading this essay about Fr Bernad. My wife'a uncle Fr Daniel Cervini SJ served in the Phillipines in the 1930s. I was wondering if he is mentioned in Fr Bernad's book or if There is any information available in the Jesuit world about Fr. Dan's ministry. This article also appeared in print, under the headline "Of Many Things," in the January 21, 2008 issue. 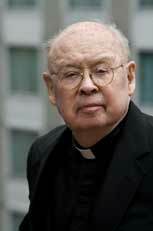 John W. Donohue John W. Donohue, S.J., is a former associate editor of America.